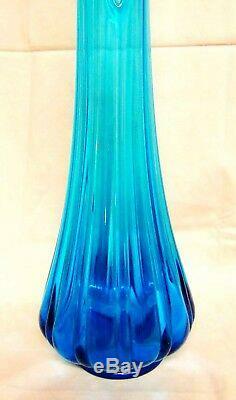 THIS IS A NICE, MCM, LE SMITH, BLUE GLASS, FLOOR VASE. THE VASE IS A SWUNG DESIGN WITH A RIBBED BODY AND SCALLOPED EDGE. IT MEASURES 29" x 7" AND IS IN VERY GOOD CONDITION. The item "VTG 29 LE SMITH, VIKING EPIC, ART GLASS SWUNG RIBBED SCALLOPED FLOOR VASE" is in sale since Wednesday, January 30, 2019. This item is in the category "Pottery & Glass\Glass\Glassware\Contemporary Glass\L. The seller is "9tara9" and is located in Brush, Colorado. This item can be shipped worldwide.